The movie Jaws has taught college students to beware the shark. But this shark poster means no harm. 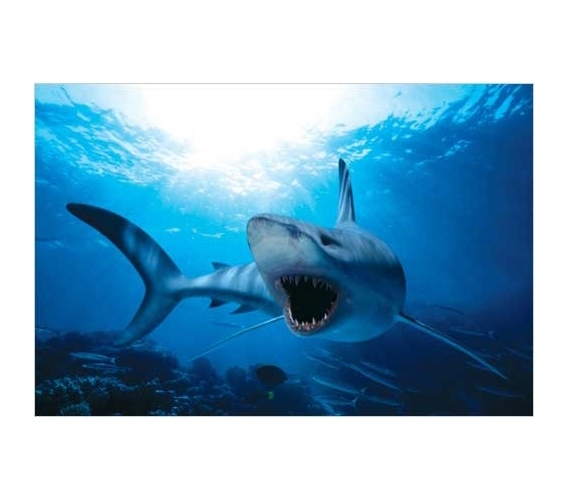 The dorm room wall poster of this White Shark Swimming in Bright Blue Water makes a statement. Bright blue, black and white colors make this college wall accessory pop against any dorm decor you can imagine. The shark looks so real, you can almost stick out your hand and touch him!! This Shark Swimming - Bright Blue Water Poster makes a great addition to any movie lovers collections. Marine enthusiasts and nature admirers will adore this majestic white shark dorm art. Some college dorm rooms won't allow large fish tanks, making this shark wall decor the perfect graduation gift for a friend with a fishtank back home. All the beauty of a fish tank, without the maintenance.